Yacht broker Ancasta has announced its line up for Poole Harbour Boat Show 2017, which takes place from 19th to 21st May 2017. As one of the UK’s largest Beneteau power and sail dealerships, it will be presenting the Beneteau Oceanis 38.1 and 41.1 as well as the popular Swift Trawler 30 and 44 motor yachts. Both the Beneteau Oceanis 38.1 and 41.1, which debuted in the UK in Autumn 2016, are designed with Finot-Conq hulls and Nauta interiors. The Oceanis range continues to offer a variety of different layouts, from number of cabins and bathrooms to a choice of galley layout, enabling clients to customise their boats to suit their style of sailing. The Swift Trawler models at the show combine classic style and design with modern technology and boast incredible sea-keeping qualities for long distance or coastal cruising. Uninterrupted windows allow light to flood into the saloon. The Swift Trawler 30 is the newest in the latest generation of the range. Poole Harbour Boat Show is open Friday 19th, Saturday 20th and Sunday 21st May from 10am to 5.30pm. 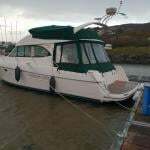 #BOATS FOR SALE – A 2001 single–owner model of one of Beneteau's most popular cruising yachts is on the market priced €115,000 on the Afloat Boats for Sale site. This Beneteau Oceanis 411 is already located for Mediterranean cruising, based in MDL Marina's new facility in Sant Carles de la Rapita, an hour's drive south from Barcelona's Reus airport. If required, her berth in Sant Carles is ready to transfer to her new owner, according to the advert. 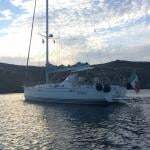 Relatively little used in her ten years, the owner says she is fitted throughout for comfortable and safe cruising. The full details are here.